In terms of design the Ignis isn’t playing safe. What’s sure to catch every millennial’s eye is how it looks from the front. The wide single frame grille that houses the headlamp units grabs attention right away. The U-shaped DRLs around the headlamps give a sense of modernity and richness to the otherwise simple front grille, and the round chrome housing for fog lamps cover up what looks like an old-fashioned front bumper. The Ignis also appears to be born out of an SUV-hatchback wedlock, after all the lines leading to up to the bonnet aren’t flowing lines, instead fairly geometric. The high bonnet line and the flat hood add some more SUV-flavour to the Ignis. A small rubber strip on the bonnet reminds us of Suzuki’s SUV heritage as this detail harks back to the original Vitara. Thankfully, Maruti Suzuki hasn’t overdone the plastic cladding to make the Ignis look butch. However, the unusually designed rear quarter gives an impression of this being a notchback. If the exterior design doesn’t seem to attract you, the interior on the Ignis certainly will. 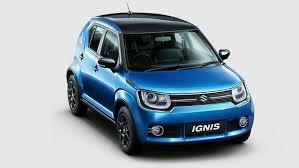 In fact, the Ignis is by far the best designed Maruti we have even had in India. The dashboard features a large touchscreen infotainment system in the top of the line Alpha model while the Zeta mid-level variant will get a standard infotainment setup with Bluetooth, USB/aux and a CD player. The touchscreen infotainment system does get both Apple CarPlay and Android Auto for the first time in a Maruti vehicle and also for the first time in the segment. The top of the line car also gets a climate control setup and toggle switch like controls which seem the be inspired from the likes of the Mini Coopers. The Ignis also gets a chunky gauge cluster with a large centrally mounted speedometer and a smaller tachometer for the top of the line variants. The gauge cluster also gets ambient lighting which can be customised. Maruti has gone with a two tone colour for the interior plastic trim on the Ignis. The upper half of the dashboard and most of the door card is finished in black with faux carbon detailing on the AC vents. The lower half of the dashboard and the door card inserts on the other hand are finished in a shade of off-white. Driving the car will leave you more than impressed. Maruti-Suzuki has gone the tried and tested way with a choice of a 1.2-litre Dualjet petrol and 1.3-litre DDiS diesel motors on offer. These engines have served a number of Maruti cars for years now and have proven their reliability, efficiency and performance. What’s more is that AMT options are available on both engines. The petrol engine uses variable valve timing, making 82bhp and 113Nm of torque. Characteristically, this engine is peaky in nature and starts to sing post 4,000rpm where progress is rapid with an affable Suzuki engine note. At idle, this engine is so silent and refined you’d have to put in some effort to hear it run. The refinement remains on the move as there were no vibrations to speak of even as speeds built up. We only drove the manual variant and it shifts positively with solid clicks from gear to gear. The diesel engine has been well known for its frugality and adequate power delivery. In the Ignis, this engine develops 75bhp and 190Nm, compensating the deficit in horsepower over the petrol variant. The diesel definitely felt faster and more responsive at lower revs. Turbo-lag is controlled and once over 2,000rpm, it keeps pulling effortlessly in each gear. Maruti claims to have tweaked the AMT transmission to shift quicker and it showed through as up-shifts were more timely and accurate to throttle inputs than the AMT-equipped Dzire diesel. The suspension in the Ignis is set up to offer a firm ride. This causes you to feel bumps and potholes at low speeds; however, ride quality does improve as speeds rise. That said, driving over sharp potholes causes the suspension to protest with a loud thud which is quite disconcerting. After driving over a fairly bad stretch of tarmac, I was left wondering why Maruti chose such a firm set-up and the answer to that was revealed as soon as I encountered a set of corners. The Ignis is quite enjoyable around a bend; however, there is a hint of body roll that you need to get past. The front end has ample of grip to pull the car into a corner and there’s only a hint of understeer when you are at the limit. Turn in is quick and precise for the car’s dimensions and mid corner bumps do not unsettle the car. The manual mode also makes it involving to drive with the rallycar-like shift pattern further enhancing the experience. What robs the Ignis petrol AMT of earning the tag of a driver’s car though is the disconnected steering. While it’s light and easy in the city, it does not weigh up as much as you’d want with increase in speed. Better feedback in corners would have certainly upped the fun quotient that this car offers otherwise . As we said in the petrol Ignis’ review, this Maruti has all the makings of a successful product. And with the masses moving to automatic transmissions, this diesel offering has a fair chance at success as well. If you are a high mileage user, drive mostly in congested areas and like to take things easy, the 1.3 diesel automatic Ignis should suit you just fine.